Kerrie Grist, from @Bristol science attraction, inspects a real human brain suspended in liquid with a to-scale skeleton, central nervous system and human silhouette carved into acrylic, as the new exhibition called 'All About Us' prepares to open to the public on Friday 11th March. Women have younger brains than men the same age, according to new research. A study basing age on metabolism rather than birth date found an average 3.8 year difference between the two. The discovery may help explain why women are more likely than men to stay mentally sharp in their later years, say scientists. All brains get smaller with age, and it was already known that men’s tend to shrink at a faster rate. The new research focused on metabolic processes that have a major influence on brain performance and ageing. The US team looked at PET (Positron Emission Tomography) brain scan images from 205 men and women ranging in age from 20 to 82. 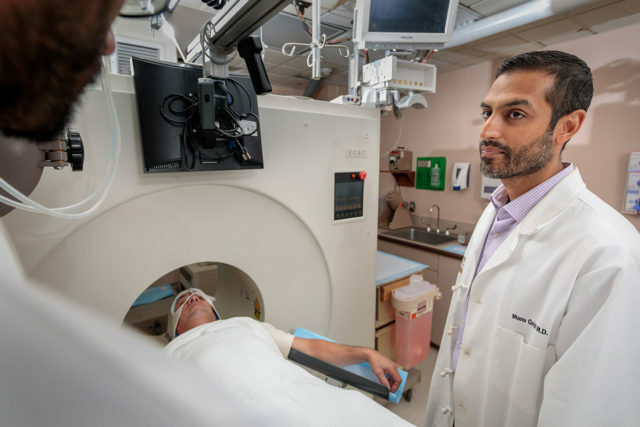 PET scans open a window to brain metabolism by measuring the flow of oxygen and glucose. The brain consumes large amounts of glucose sugar for energy, but the pattern of use alters with age. For the study, the scientists used a machine learning computer programme to explore the relationship between metabolic and chronological brain age. They found that metabolic brain ageing tracked chronological ageing in both men and women. But analysis of the data showed that at any given age women’s brains were younger, metabolically speaking, than men’s – by an average of 3.8 years. The relative youthfulness of women’s brains is detectable even among the youngest participants, said the researchers writing in the journal Proceedings of the National Academy of Sciences. Lead scientist Dr Manu Goyal, from Washington University School of Medicine in St Louis, said: “It’s not that men’s brains age faster – they start adulthood about three years older than women, and that persists throughout life. The initial study was conducted by first training the machine learning algorithm using men’s ages and brain metabolism data. The programme was then directed to calculate each woman’s brain age from its metabolism. When the study was reversed – by training the algorithm on women’s data and applying it to men – it produced a slightly different result. However, it still found men’s brains to be 2.4 years older compared with women’s. In their paper, the researchers wrote: “We find that throughout the adult lifespan the female brain has a persistently lower metabolic brain age – relative to their chronological age – compared with the male brain. Older women tend to score better than men of the same age in tests of reason, memory and problem solving, the scientists pointed out. They are now following a group of adults as they age to see whether people with younger-looking brains are less likely to develop cognitive problems.